The Keynotes and all Education Sessions will be simultaneously interpreted into French, German, Italian, Portuguese, Russian, and Spanish. Inclusive Fitness…How Will This Really Benefit YOUR Business? For a business perspective on ALL sizes and types of clubs and studios, learn the importance and impact of inclusive programs, understand what having an inclusive culture in your club really means, discuss the challenges clubs faced in implementing an inclusive culture, aspects of club culture, staffing, and environment that make programs most successful. Most importantly discover the benefits—for both the club and members of being inclusive. UFIT is led globally by the UNESCO Chair in Inclusive PE, Sport, Fitness & Recreation and IHRSA. Hear from the UFIT Global leaders and a UFIT-recognized club chain (Xercise4less) on the benefits of joining the inclusive fitness revolution. Join the Fitness Revolution #letsinclusivizefitness. We need to learn to lead differently in order to keep up with macro trends affecting the way we work, whether they are changes in the workforce or outside influences such as the change in the digital landscape. How do leaders ensure they remain relevant and thrive in a disrupted world? Lucy will provide you with insight on how to lead your team and business differently while staying resilient. The secret to successful change is often lost in the complexity of planning for change where process takes over from people. Small improvements by inspired people every day remove the need for large-scale disruptive changes. Chris will take you on an inspirational journey showing change is an opportunity more than a challenge and explain how to ensure that people are at the center of change, inspired to give their best every day and deliver success. Discover key differentiators of user experience, which leading clubs around the globe are using to win in their marketplace. Review specific examples of clubs and demonstrations of their 5 user experience differentiators. Explore the primary building blocks of the execution engines including specific technologies that clubs are using to deliver on the 5 user experience differentiators. Discuss the human capital and the aspects of people and how it relates to the 5 user experience dynamics. Define your plan of attack on how to achieve being among the top brands deliver on best practice user experience. Gain an understanding on why design is more than the composition of visual elements—it is the creation of an emotional experience. Learn how to dissect the design process focusing on how to allocate your budget in order to deliver the greatest impact; and discover what you can do with limited capital to create an expensive look. Explore how small adjustments in lighting can create an entirely different atmosphere. Learn how equipment layout is an art process. Review some of the biggest mistakes club operators make that you can avoid. Gain an understanding of the most important KPI in our industry: retention. How to learn from cancellations and improve customer touchpoints. Explore the importance of the first 30 days and habit creation in customer retention. Review how and why the low-cost segment is incorporating new gym users. Gain insight on the role commoditization and differentiation play, and why they are critical elements to the low-cost segment. Learn how to construct a business that combines efficiency and effectiveness. Discover how to plan and develop a customer journey to sustain your model. Explore how to continue to be disruptive over the coming years and avoid the path dependency. Learn how to make a winning first impression. Discover foolproof ways to build rapport. Explore modern approaches to gym tours that create the desire to buy. Review strategies for overcoming objections with the perfect pre-close. Implement strategies to upsell and gain referrals at the point of sale. Learn what EQ is and how it can impact your results as an effective leader. Gain clarity into the four pillars of EQ and how to use them to transform your own and your teams’ performance. Sharpen your communication skills and empower your team by tapping in to their preferred behaviour and communication styles. Learn how to apply EQ skills to improve customer service and team dynamics. Learn the key drivers on how to achieve happy and motivated employees who align with your brand and go above and beyond to reach your targets. The pursuit of excellence makes managers in every organization look for the best behavioural training in order to maximize results. Behaviours, however, are not the key to personal and team excellence—an affirmation that comes from the careful observation Pedro has made of more than 500 different teams in action! In this dynamic presentation, attendees will learn the 3 secrets for personal and team excellence in a simple and efficient way in order to increase results. The opportunity to meet one-on-one with leading suppliers of fitness equipment and services at Education Sessions presented by suppliers, at lunch in the Supplier Showcase, and throughout the event. Opening and Closing Receptions will give you the opportunity to meet more than 500 industry professionals. 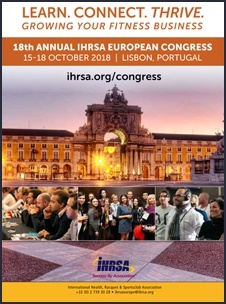 "I'm planning to attend the 18th annual IHRSA European Congress in Lisbon this October. I'll attend with some of my senior team members because it's a great opportunity to connect with other fitness leaders and support our industry."